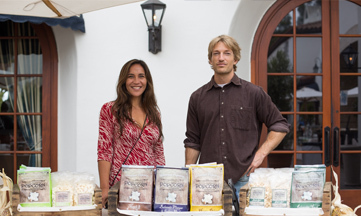 Our Story – Santa Barbara Popcorn Co.
Our heart lies with our community, and we enjoy supplying the people of Santa Barbara with our artisan craft. As a small growing business, it is our intent to offer the tastiest and highest quality snack food possible. Over a decade ago, the original idea was sparked with Christopher’s best friend Javin during their time at UCSB. Over the years, he experimented with original recipes and vetted them with family and friends. Ten years later while teaching Biology, Christopher met Leiha Dulawan at Dos Pueblos High School. After several rounds of Frisbee together he decided to entrust her with his savory secret and show her what he had created. Creating something original that took years of work and offering it out to the world gives a different type of satisfaction than teaching. Taking that leap can be scary because it opens you to the risk of failure, but it also allows the possibility of success. With Leiha’s talents in design and marketing, she lent her honest professional opinion. Not only did she love the brand, she loved the popcorn. Working at Dos Pueblos High School in various capacities, she saw a partnership opportunity that would raise valuable funds for school programs, while supporting local business in the process. After much consideration Santa Barbara Popcorn Company became one of the high school’s leading fundraisers, enabling DPHS to give over 20 community members swim lesson scholarships for the previous two summers. This partnership was an early success that helped launch the business, and Leiha gradually became increasingly involved with the growth of the company. Amy Chalker of Isabella Gourmet Foods was another early adopter to stock the popcorn in her new downtown shop on State and Figueroa. From the start, she has been one of our best and favorite customers. Gratitude is owed for her ongoing support.